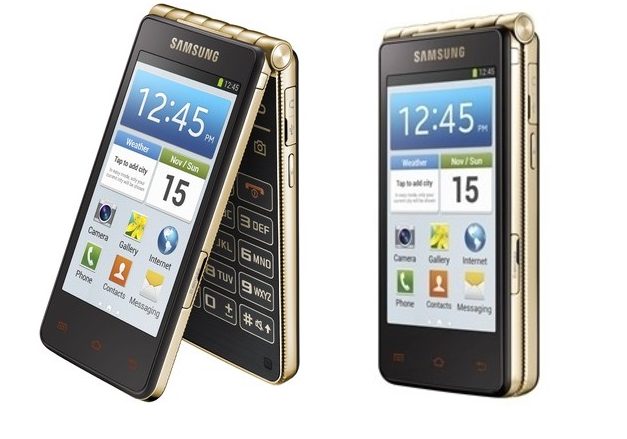 Samsung today launched its unconventional Dual Screen Android flip phone, Samsung Galaxy Golden, which comes in Champaign golden color priced at a whooping Rs. 51,900. Yes, as you would have understood by now this phone is not meant for general masses. This phone has Dual Super AMOLED 3.7 inch displays with WVGA resolution. Cleary the phone is not intended for those who have to watch Multimedia files and thus the resolution will suffice for the screen size. Samsung Galaxy golden is powered by 1.7 GHz Dual core processor backed by 1.5 GB of RAM. The internal memory is 16 GB and is extendable up to 64 GB. Again you won’t be using this handset for Gaming but only for day to day basic usage and the chipset is more than capable for that. The primary camera is of 8 MP with LED flash and a secondary camera of 1.3 MP is also present for video calling. The phone runs on Android 4.2 operating system. The Hidden receiver feature allows you to take call without opening the folder and the Easy Mode gives you large fonts for easy visibility. The battery capacity is 1820 mAh. Connectivity features include 3G, WiFi, Bluetooth 4.0, GPS, GLONASS. Absence of 4G LTE is a miss considering the target customers. Nokia 515 was another unconventional phone from Nokia which provides for a feature phone with metallic body design, Corning Gorilla Glass and 9 button keypad. Believe it or not, there is still an untapped market for those who prefer a good Solid feature phone in a premium package. The phone went on sale recently at 10,505 INR. Clearly this phone is meant for people who don’t prefer touch phones and have to engage in loads of day to day calling activity. It provides an expensive premium option to such users with deep pockets instead of the other option of a extremely cheap feature phones or QWERTY keypad BlackBerry. As we earlier pointed out this is not for the masses. This phone is available for Pre-Order at Rs. 49,900 from Flipkart and is available for purchase at 51,900 INR from Infibeam.